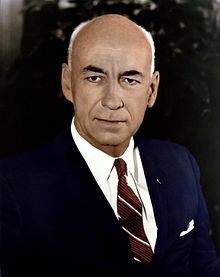 Robert Rowe Gilruth (October 8, 1913 – August 17, 2000) was an American aerospace engineer and an aviation/space pioneer who was the first director of NASA's Manned Spacecraft Center, later renamed the Lyndon B. Johnson Space Center. He worked for the National Advisory Committee for Aeronautics from 1937 to 1958 and its successor NASA, until his retirement in 1973. He was involved with early research into supersonic flight and rocket-powered aircraft, and then with the United States manned space program, including the Mercury, Gemini, and Apollo programs. Gilruth was born October 8, 1913, in Nashwauk, Minnesota, and moved to Duluth when he was nine years old. He graduated in 1931 from Duluth Central High School. As a teenager, Gilruth was fascinated by aeronautics and spent time building model airplanes. He was inspired to pursue a career in the field after reading about NACA’s Langley Memorial Aeronautical Laboratory in Virginia. Gilruth received a Bachelor of Science degree in Aeronautical Engineering at the University of Minnesota in 1935, and received his Master of Science degree in 1936. While there he was a member of the Professional Engineering Fraternity Theta Tau, of which he was later inducted as a Hall of Fame Alumnus. In January 1937 Gilruth was hired at NACA’s Langley Memorial Aeronautical Laboratory, where he performed flight research. His research led to the NACA Report R755, Requirements for Satisfactory Flying Qualities of an Airplane, published in 1941, in which he defined a set of requirements for the handling characteristics of an aircraft. Until this point, no set of guidelines for pilots and aircraft designers existed. Gilruth also pioneered the recording of data from instruments during flight test, to be later correlated with the pilot's experience. This would go on to become the standard operating procedure. Gilruth had been working on hypersonic missile rockets as the assistant director of the Pilotless Aircraft Research Division of NACA. He and his team pushed their superiors to pursue a program to launch satellites into space, but he was rebuffed by administrators. The dynamic quickly changed after the Soviets succeeded in launching Sputnik, and Gilruth became involved in the transition of NACA into NASA. When NASA was created, Gilruth became head of the Space Task Group, tasked with putting a man in space before the Soviet Union. When President John F. Kennedy announced that America would put a man on the Moon before the end of the decade in 1961, Gilruth was "aghast" and unsure that such a goal could be accomplished. He was integral to the creation of the Gemini program, which he advocated as a means for NASA to learn more about operating in space before attempting a lunar landing. Soon the Apollo program was born, and Gilruth was made head of the NASA center which ran it, the new Manned Spacecraft Center (MSC) (now the Johnson Space Center). Gilruth was inducted into the National Space Hall of Fame in 1969 and served as director of the MSC until his retirement in 1972. He was inducted as a member of the inaugural class to the International Space Hall of Fame in 1976. He oversaw a total of 25 manned space flights, from Mercury-Redstone 3 to Apollo 15. He, along with the Apollo 15 crew, was awarded the 1971 Collier Trophy. Gilruth died in Charlottesville, Virginia, at the age of 86. In 1992, Gilruth was inducted into the International Air & Space Hall of Fame at the San Diego Air & Space Museum. In the 1996 TV movie Apollo 11, Gilruth was played by William Mesnik. In the 1998 miniseries From the Earth to the Moon, he was played by John Carroll Lynch. In the 2016 film Hidden Figures, the character Al Harrison, played by Kevin Costner, is based largely on Gilruth. In the 2018 film, First Man, Gilruth is portrayed by Ciarán Hinds. ^ "Former Manned Spacecraft Center Director Dies". NASA. Retrieved January 17, 2017. ^ "Robert Gilruth Inducted into the Minnesota Aviation Hall of Fame". Duluth Aviation Institute. Retrieved January 17, 2017. ^ a b c Chaikin, Andrew. "Bob Gilruth, the Quiet Force Behind Apollo". Air & Space/Smithsonian. ISSN 0886-2257. Retrieved 27 July 2016. ^ "Monographs in Aerospace History: Flying Qualities". NASA. Retrieved January 17, 2017. ^ Wilford, John Noble (August 18, 2000). "Robert Gilruth, 86, Dies; Was Crucial Player at NASA". The New York Times. ^ "Modern Figures: Frequently Asked Questions". NASA. Retrieved January 17, 2017. Wikimedia Commons has media related to Robert R. Gilruth. Robert Gilruth biography at the National Academy of Sciences, written by NASA flight director Christopher C. Kraft Jr. This page was last edited on 4 April 2019, at 02:22 (UTC).